Pesto is one of my favorite aromatic foods. The scent of fresh basil, mixed with garlic, parmesan and olive oil is heavenly. It’s such a fresh and bright aroma. It livens up the kitchen and makes the anticipation of eating it even greater. Be prepared. You’re going to need a lot of basil to make this delicious pesto sauce. Hopefully you’re lucky enough to have your own garden with fresh basil growing to spare. I don’t. In fact I only occasionally have a small basil plant growing on the windowsill in my small apartment. It’s never enough to make a hearty batch of pesto. Pesto is so easy to make that I can’t understand why I don’t make a batch of it weekly. A plate of pesto pasta is a thing of true joy for me. What you’ll need is a large batch of basil leaves, some high-quality olive oil, pine nuts, Parmesan cheese, garlic and salt. Mix all of these things in either a blender, food processor or with a stick blender. I love this Cuisinart Mini Prep Food Processor. It’s perfect for the job. A regular-sized food processor will work well for large batches, but can be too large for a smaller batch of pesto. I also really like the Cuisinart Smart Stick hand blender. The chopper attachment is perfect for making pesto. The blender does all the work for you. With a press of a button, pesto is made. The heavenly smell of fresh chopped basil will flood your kitchen. Be prepared for the mouth watering to start. My favorite thing to put pesto on is 3-three ravioli. The flavors meld together so well. But there are many different pastas you can pair with a pesto. Try tagliatelle pasta. It’s has just the right surface area and delivers the perfect amount of pesto in each bite. 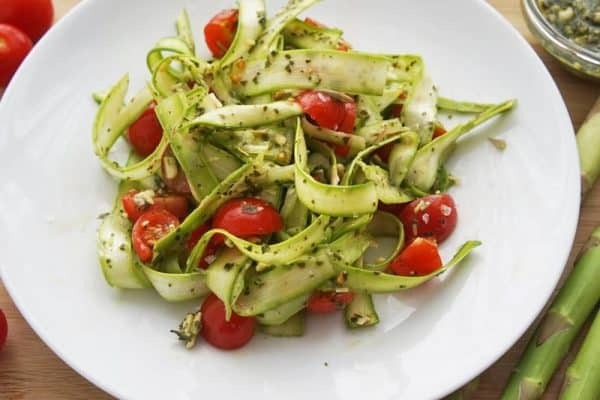 If you like asparagus, you’ll love our Shaved Asparagus Pesto salad. The pesto is a perfect sauce for light and wispy asparagus ribbons. Another favorite of ours is gnocchi with pesto. You can learn to make your own gnocchi at home, too. If you were to freeze homemade gnocchi and pesto, you could have a meal ready in moments. When we were in Venice last year, we had a wonderful plate of paccheri (oversized rigatoni) with pesto that was incredible. Get creative! You can serve pesto on just about anything, even steak or potatoes. If you’re not a big basil fan, I will eventually forgive you. I guess it’s possible that not everyone loves this herb. If that’s the case, you can use other herbs to make pesto. You could try arugula and walnut pesto for a spicy alternative, or spinach and pine nut for a milder version. You should also feel free to leave out an ingredient if you don’t want it. For instance, you can leave out the garlic, or substitute the pine nuts with walnuts. I sometimes think just basil and a really high-quality olive oil is all that’s needed. But it’s up to you. Like this recipe? We’d love for you to share it on Pinterest. Just click the pin button. This quick and easy-to-make basil pesto is so fresh, aromatic, and full of bright herbaceous flavor. Add all ingredients to a food processor or blender and puree for 30 seconds. Stop to stir and push leaves down. Puree for an additional 15 seconds. Transfer pesto sauce to a small serving bowl. Add to pasta or food as desired.